Shop online for over 600 vollmer model trains at discounts up to 22%. Buildings is the most popular of the 9 vollmer model trains categories, then Railroad Scenery, and Roadway. 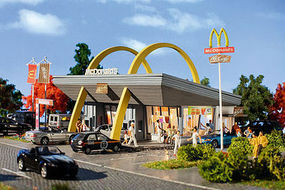 This is the McDonald's Restaurant w/McDrive Kit Model Railroad Building in HO Scale by Vollmer. This is the House Set (4) Model Railroad Building in Z Scale by Vollmer Gmbh. 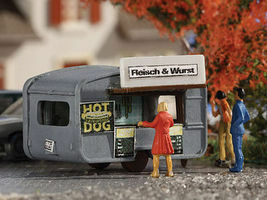 This is the Hot Dog Stand Concession Trailer Model Railroad Building in N Scale by Vollmer. 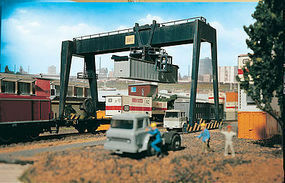 This is the Container Crane Kit Model Railroad Building in N Scale by Vollmer. 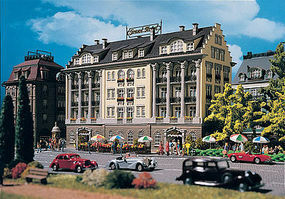 This is the 4 Story Hotel Kit Model Railroad Building in HO Scale by Vollmer. This is the Swimming Pool Kit Model Railroad Building in HO Scale by Vollmer. This is the Industrial Chimney Kit Model Railroad Building in HO Scale by Vollmer. 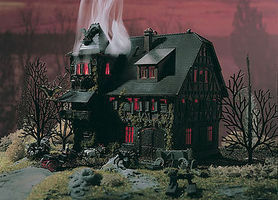 This is the Vampire Villa Haunted Mansion w/Flickering Light Kit Model Railroad Building in N Scale by Vollmer. This is the Campfire w/Flickering Light Kit Model Railroad Building Accessory in HO Scale by Vollmer Gmbh. This is the Parking Garage Kit Model Railroad Building in HO Scale by Vollmer. This is the McCafe (McDonald's Coffee House) Kit Model Railroad Building in HO Scale by Vollmer. This is the Farm Supplements Model Railroad Building Accessory in HO Scale by Vollmer Gmbh. This is the Bungalow Kit Model Railroad Building in N Scale by Vollmer. This is the Horse Paddock w/Horses Kit Model Railroad Building in N Scale by Vollmer. This is the Engine Repair Platform Kit Model Railroad Building in N Scale by Vollmer. This is the Country Inn w/Beergarden Kit Model Railroad Building in N Scale by Vollmer. This is the Post Office Building Kit Model Railroad Building in HO Scale by Vollmer Gmbh. This is the Vampire Villa Kit Model Railroad Building in HO Scale by Vollmer.